Ford Transit Forum • View topic - Short wheelbase medium top Minibus free to good home. Short wheelbase medium top Minibus free to good home. RHD Transit short wheelbase medium top Minibus 1989 free to good home. Now registered and located in Northern France. I've decided it's time to buy a transit with power steering so sadly it's time to part company. I've had the vehicle for 14 years and she's never let me down, but she is getting a bit frayed around the edges now. Both rear wheel arches need replacing and there's some rust in other places, notably at the bottom of the near side rear door. Engine starts first time every time and runs well, brakes good, battery good, steering good, tyres are a few years old but seem good with plenty of tread. I only do a couple of thousand miles a year in her (if that). No oil leaks but the injector pump weeps a bit, but not enough for me to have had it replaced. Exhaust good. All the rear seats have been taken out but I do have them and will go with the vehicle. Tow bar fitted. 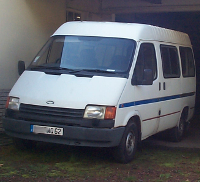 Originally an 11 passenger plus driver vehicle, I registered her in France as a nine seater because the law on minibuses is different to that of the UK. Consequently the rear row of seat belts have been taken out. The French MOT (control technique) runs out on April 24th so she can be legally driven (with your own insurance) until then. There's no vehicle tax in France so that's not a problem. I live one and a half hours drive from Calais in the village of Cavron St Martin, mid way between Hesdin & Montreuil Sur Mer. the original UK registration was F 521 TGV. I believe it's fairly simple to re-register with original reg in the UK, possibly even free to do so, but not sure. Until last year she was kept under cover in our very large garage. I'm happy to answer any questions you might have and can take photos if you wish. I'd really love to see the old girl go to someone who has the expertise to restore her to her former glory. I'll be very sad to see her go as she's been a great multi purpose vehicle. Apart from new brakes and rear wheel bearings and a couple of batteries I've spent very little on her. The cam belt was replaced 5 years ago so although mileage hasn't been reached it could do with being replaced I think. Re: Short wheelbase medium top Minibus free to good home. Yesterday we put the vehicle through the French Control Technique (MOT) to get an idea of what needs to be done and it passed with flying colours. So we've decided to keep it for a bit. If anyone is interested let me know and I will contact you when it does become available. In the meantime we are still looking for another transit with power steering.